Half-Life is a game I’ve probably started a half-dozen times, yet never completed. It was one of the first video games I owned for a computer and I can still recall, quite vividly, when my mom bought it for me at a garage sale. Around this time – middle school – I had a burgeoning interest in video games, just as my enthusiasm for soccer waned. I had never heard of the game before but upon seeing the acclaim advertised on the big box Game of the Year Edition, I decided I needed to know about it. The year is 2069. Once common forms of government now occupy historical archives on the dataverse, having been supplanted by mega-corporations decades ago. These mega-corporations, or syndicates, are few and amongst them Eurocorp is dominant, thanks to their invention of the DART chip: a neural implant allowing access to the dataverse. Unique syndicate specific versions are embedded in roughly half the world’s population, creating a societal divide between the haves and the have nots, metaphorically illustrated by the lush skyscrapers users live, work, and shop and the destitute “downzone” areas on the surface. As they’ve vied for control of the populace and protection of their intellectual property, corporate espionage and outright warfare have become standard, necessitating the need for bio-engineered agents enhanced with the latest in chip technology. With Cubivore: Survival of the Fittest done and dusted, I thought I’d turn my attention to another game that’s been on my backlog for years: Singularity. Developed by Raven Software and published by Activision on June 29, 2010, it’s an alternate history first-person shooter centered on the Cold War and time manipulation. Accordingly, it has a few unique, and fun, time-based gameplay mechanics. The gunplay is solid but clearly intended for a mouse and keyboard in favor of a controller. Speaking of favors, I did myself none by playing on the hardest difficulty. Nonetheless, it lived up to my expectations and was a net-positive experience. I’m a little late to the party on this one but I finally beat Portal. It’s an ingenious puzzle game that doesn’t overstay its welcome. In fact, I was befuddled that it was over as quickly as it was. Since I’d heard so much revelry and acclaim for it and witnessed the cultural impact it’d had in the gaming space I just figured there’d be more of it. What was there engrossed me though. The increasingly complex puzzles were mentally stimulating and the enigmatic GlaDOS’ darkly humorous speech had me chuckling well into the few hour experience. 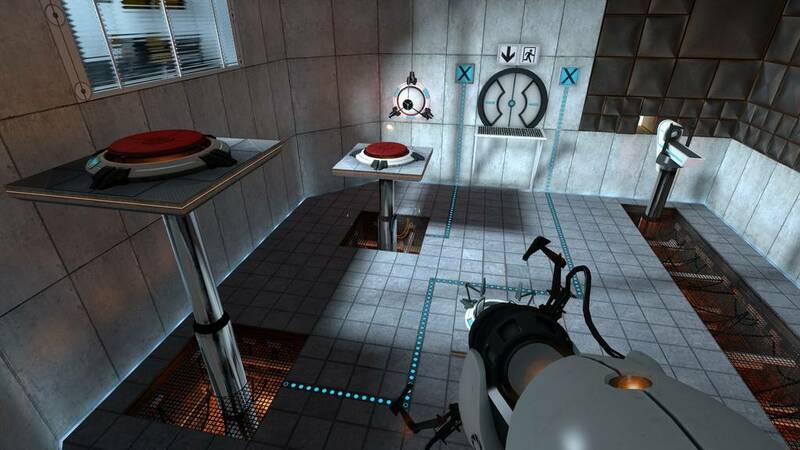 Portal was a puzzle game with an ingenious mechanic. The game is built around the portal gun which allows users to shoot portals on flat surfaces. The portals are connected and can be easily referenced as an entry and exit. At its most basic use, I could place a portal on ground level, shoot the other portal on a wall above a higher level and use the portal to reach higher ground without using a ladder. Through the game’s nineteen test chambers, the quandaries were rarely this simplistic. The way I had to manipulate the portals was fascinating and thought-provoking. Dropping into one and utilizing the momentum to fling myself across the room was always amazing. As I mentioned the game has nineteen test chambers that lock progression behind increasingly difficult puzzles. There are no other lifeforms present although observation windows and empty chairs indicate there were at some point. Guiding the player through these chambers is GlaDOS, a disembodied mechanical female voice. Her statements are delivered with a sense of dry, deadpan seriousness that are made clear when her motivations are discovered. Things are not what they seem and while there is no narrative, there’s an abundance of environmental storytelling that allows the player to fill in the gaps themselves. It all culminates in an appropriate ending sequence that was riddled with GlaDOS’ hilarious interruptions. Infinite portal loops were easy to do and fun to witness. For most I’ve probably revealed nothing new about this game. 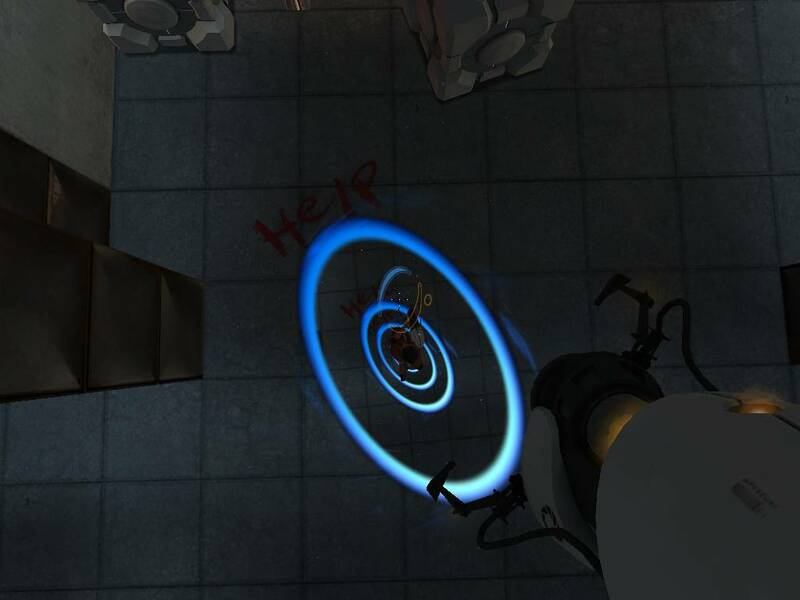 Portal sent shockwaves through the gaming culture when it arrived in 2007 as a part of The Orange Box and is still highly regarded and oft-discussed. I’m glad to have finally experienced it and would recommend it to those who have yet to do so. The game was brief but left me both fulfilled and wanting, in a good way. I can only imagine the impact the modding community had on this title and I’m excited to see the crazy stuff they came up with. Who can say what sparked it, but one evening Jeff and I played the Sega 32X. It’s an add-on for the Sega Genesis that increased its power but never proved successful for a variety of reasons, namely poor timing. Its library rounds out at about forty titles which pales in comparison to the nine hundred plus that the Genesis hosted. Along with it, I also have a Sega CD which makes setup an absolute chore. There are three power bricks (although only two are needed if the Sega CD isn’t being utilized), an A/V cable connecting the Genesis and 32X, and an A/V cable connecting the monstrosity to the TV. Our session was a memorable one though, so it was worth it. With such a limited library there aren’t a lot of options, especially when I only have a few games. The two that we spent the most time with were Virtua Racing Deluxe and Doom. As he’s not partial to racing games we barely touched VRD. That game’s primitive polygonal graphics can be off-putting at first, but I was surprised at how fast and responsive the game was; it’s definitely a worthwhile title. Therefore, we spent our time with Doom. Our session lasted a couple of hours, and we wound up making it to the final stage*. One knock against the 32X version is the limited real estate devoted to the game screen. His experience with Doom supersedes mine, having played it on PC closer to its cultural explosion. My first gameplay exposure came with the Xbox Live Arcade release. I couldn’t tell you what went through my head then, but I don’t remember being blown away, even considering the context of its release. After all, this was the most significant of the early first-person shooters and became one of the most popular, if not played, video games up to that point in time. Honestly, I wasn’t particularly jazzed about playing the 32X version but it’s hard to ignore how well-made it is, even this version. For hours, we blasted demons with a handful of weapons and searched for keycards in order to open locked doors and progress to each level’s exit. That took place across fifteen-odd levels, with one or two focusing on a boss fight rather than exploration. On paper, this all sounds monotonous, but the gameplay was quite fun. 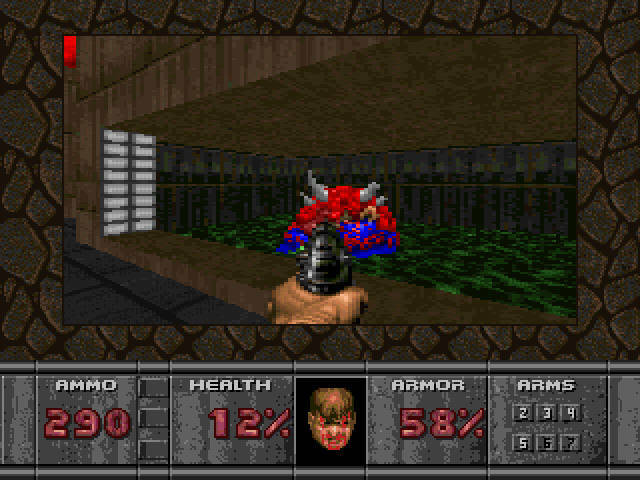 It was a fast-paced shooter and the stages and enemy encounters never felt duplicated, despite a limited palette of either. Undoubtedly, playing with a friend and taking turns completing levels enhanced my enjoyment. 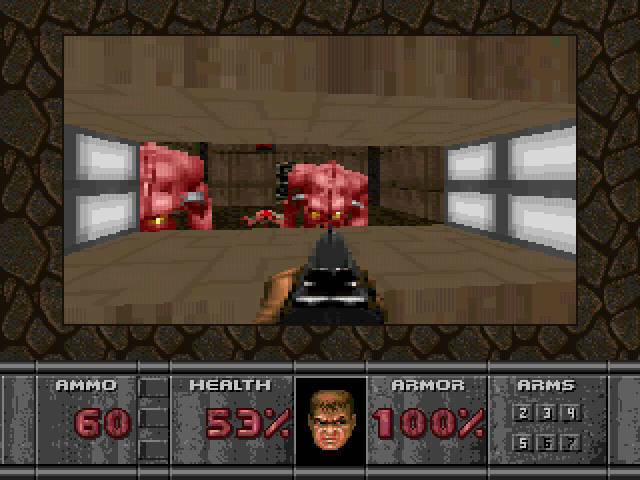 Doomguy, now’s not the time for knock knock jokes! This newfound enjoyment and appreciation of Doom surprises even me, considering I really enjoyed Doom 3 – a game most others didn’t. I’m contemplating more Doom and my next steps branch two ways. The 32X version was a port of the PC original which hadn’t even fully released at the time, so I haven’t completely seen Doom (which this FAQ detailing version differences is just phenomenal). I’ll either start up the XBLA release or the version included with the Doom 3 Limited Collector’s Edition. 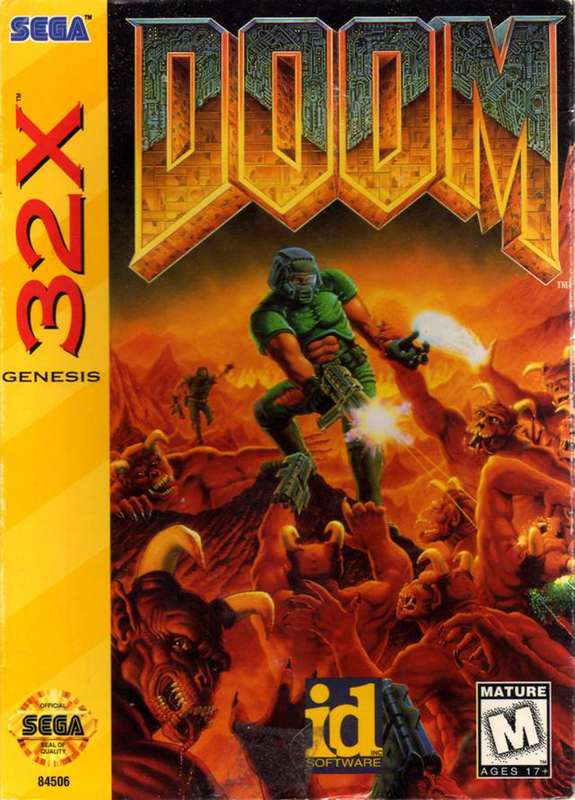 I’ve also never played Doom II: Hell on Earth so that’s a natural progression too. Either way, I’m excited to play more Doom. I guess that’s one redeeming quality for the 32X. * The final stage to reach the credits. If we had reached the same stage on a harder difficulty, there were actually two more stages.